LEDs are the light of the future. An LED array can deliver unmatched long term reliability, outstanding brightness, low power consumption, shock and vibration resistance with no maintenance required. To increase safety, LEDs light up faster than incandescent globes, this reduces response reaction times, giving earlier warning which leads to quicker braking. LEDs are solid state devices requiring little power and generating little heat. Because their heat generation is low and because they do not rely on material to generate light, LEDs have long operating lifetimes. There is no glass or filament to break making them completely resistant to shock and vibration. Incandescent globes were the dominant light source of choice in indication applications since they were first introduced. These globes consists of a heated metal filament that radiate light inside a clear bulb. The radiated light is white consisting of a wide spectrum of electromagnetic radiation generating high intensity light and requiring excessive power to operate. Because the globe generates a great deal of heat it causes the filament to deteriorate. The filament is also susceptible to damage from vibration and shock. 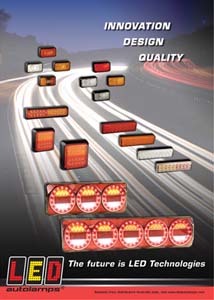 CLICK ME TO SEE THE LED AUTOLAMPS RANGE! Popular range available to order using the above link! CONTACT NOEL COMERFORD'S AUTO PARTS, PAINT & ACCESSORIES FOR ALL YOUR LED AUTOLAMPS LIGHTING REQUIREMENTS.